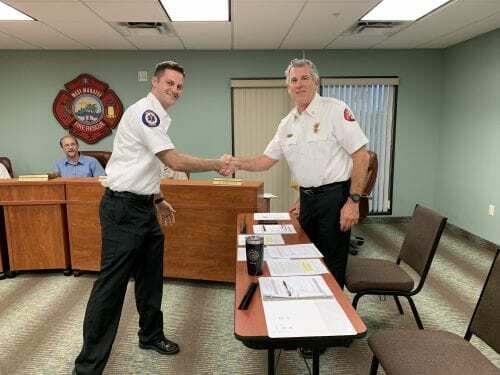 BRADENTON – When Chief Tom Sousa retires from the district in October, West Manatee Fire Rescue will have a new chief in Battalion Chief Ben Rigney. When Sousa announced his early retirement from the district, board members decided to open the position first to internal candidates before considering allowing non-district employees to apply. Out of that first round of searching, one internal candidate emerged – Battalion Chief Ben Rigney. During a March 19 meeting, commissioners voted unanimously in favor of appointing Rigney as Sousa’s successor as fire chief, contingent upon contract negotiations with board Chair David Bishop. The terms of the contract will be brought before the board at a future meeting. Commissioner Larry Jennis, who headed the selection committee, recommended the board do away with the final phase of the application process, presenting a short oral presentation to the board. Jennis said that with Rigney having already presented to the board numerous times there was no reason to ask him to do it again, something his fellow commissioners agreed with. Rigney’s appointment to the fire chief position will be effective upon Sousa’s retirement, expected Oct. 17. Commissioner Randy Cooper said he feels that Rigney is well qualified for the position and has good ideas to move the district forward in the future. “I’m looking forward to working with him,” he said. “I think he’ll make a fine chief,” Commissioner George Harris said. “I’m very pleased with the candidate,” Commissioner Al Robinson said. For his part, Sousa said he’s very pleased with the choice of Rigney as his successor. “The district’s in great hands so everything’s going to work out great,” he said.